War of the Human Tanks – Limited Operations Commencing on Steam! October 28, 2015– The thrilling conclusion to the trilogy is coming! Independent game publisher Fruitbat Factory is proud to announce the third part of Yakiniku Banzai!’s critically acclaimed War of the Human Tanks trilogy, War of the Human Tanks – Limited Operations is coming to Steam and other distributors this winter. The land of Japon has been split in two and thrown into war by two nations, the Empire of Japon and the Kingdom of Japon, who use biological weapons known as “?Human Tanks” to fight their war. But now the war between these two has turned into a proxy war between the Human Tanks themselves. “Limited Operations is designed so that no previous knowledge of the series is required to hop in. Old fans will find delightful details as they make new acquaintances and reunite with old friends.” says Jakke Elonen, Project Lead. War of the Human Tanks – Limited Operations will come priced at $9.99. The game will include Steam Trading Cards, Achievements and other Steam features. 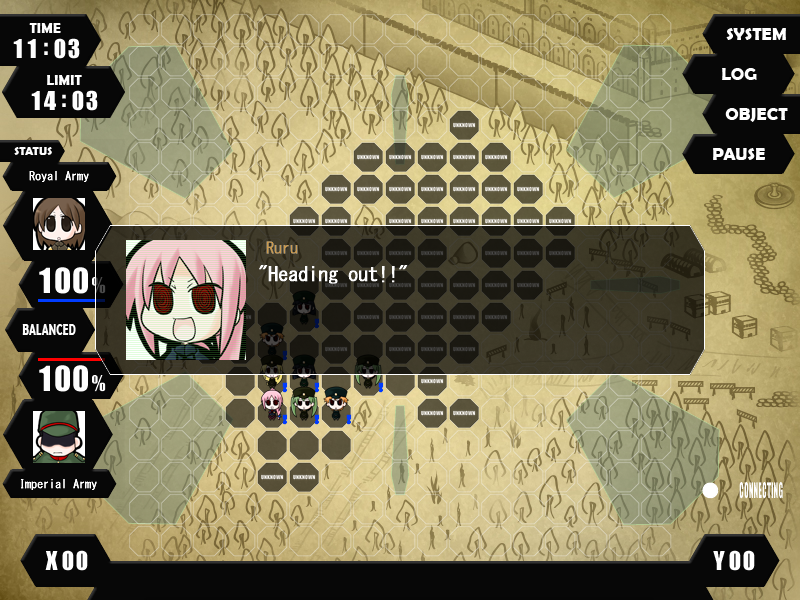 The game’s opening and screenshots can be viewed on the Steam page. War of the Human Tanks – Limited Operations is now available for pre-order at the official Fruitbat Factory store. As a special pre-order bonus, all pre-orders will receive War of the Human Tanks – Limited Operations: Unlimited Edition (normal price: $12.99) for the price of the regular edition. The Unlimited Edition includes the game’s soundtrack, Sound of the Human Tanks – LO. War of the Human Tanks – ALTeR Now on Steam! February 13, 2015. 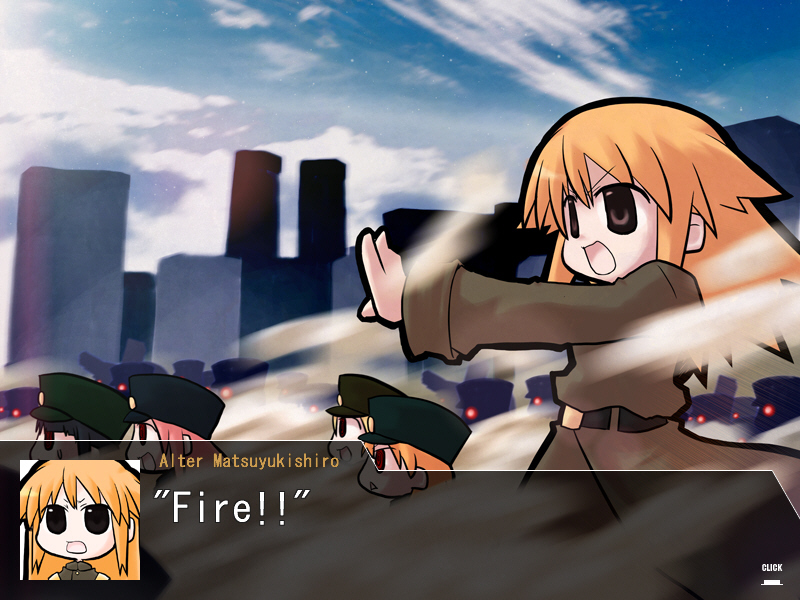 Fruitbat Factory is happy to announce the release of our fifth game on Steam: War of the Human Tanks – ALTeR. The game is available today. Human Tanks – ALTeR is the second installment of the War of the Human Tanks series, and sequel to War of the Human Tanks. This time you assume command of the enemy of the first game, the Royal Army, and fight back for all you hold dear! 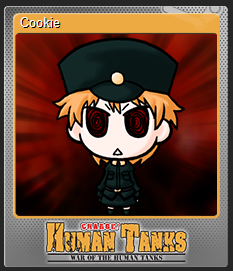 “I always liked the Royal Tank designs of the original game and ALTeR lets you have them all – and I mean ALL. Playing on the other side, you discover a whole range of new characters, while still having some familiar faces along too.“ says Ozhan Sen, Art Lead. War of the Human Tanks – ALTeR comes with the three DLC created by Yakiniku Banzai for the original Japanese release built in – Blue, Black, and White. Delve deep into the Great Cavern of Mt. Fuji and tackle ever more impossible odds in over 90 extra stages, and reveal more about the history of all Human Tanks! In addition, players who have completed War of the Human Tanks may import their save to unlock a special bonus unit in ALTeR! “I’m particularly excited to see player responses to the Great Cavern of Fuji. It’s big. Main campaign might take up to 10 hours, for the Cavern we’re talking about 50+. There’s so much to see and do and learn. I think it will surprise those who venture there.“ explains Jakke Elonen, Project Lead. The game is released on Steam and other leading digital distributors on February 13th. The retail price is $12.99, with a -10% launch week discount. Additionally, a War of the Human Tanks – ALTeR – Royal Edition will be made available for $19.99, including the game and the 90-track OST, Sound of the Human Tanks. Fruitbat Factory is an independent localization house focusing on bringing interesting Japanese indie games to English-speaking audiences. Yakiniku Banzai! is an independent Japanese game circle best known for their ‘War of the Human Tanks’ series. Fruitbat Factory Reveals Five New Games! May 13, 2014 – Fruitbat Factory is happy to announce five new games to be released for English-speaking audiences worldwide on PC (Windows). The long-awaited sequel to the original strategy game War of the Human Tanks. The third and final installment in the Human Tanks series with many new challenges. A bullet hell shooter starring the pudding-loving dog girl QP from 100% Orange Juice. A new adventure starring Saki and Komiya from 99 Spirits alongside new faces. Another 99 Spirits story featuring Waka and Kotetsu in a thrilling web of events. is the much-awaited second installment of the Human Tanks, Charge! series, and sequel to War of the Human Tanks. This time you assume command of the enemy of the first game, the Royal Army, and fight back for all you hold dear! is the last of the three games in the Human Tanks, Charge! series. In contrast to the first two games, Limited Operations has the player complete difficult missions with pre-assigned resources and face up against even harder opponents. 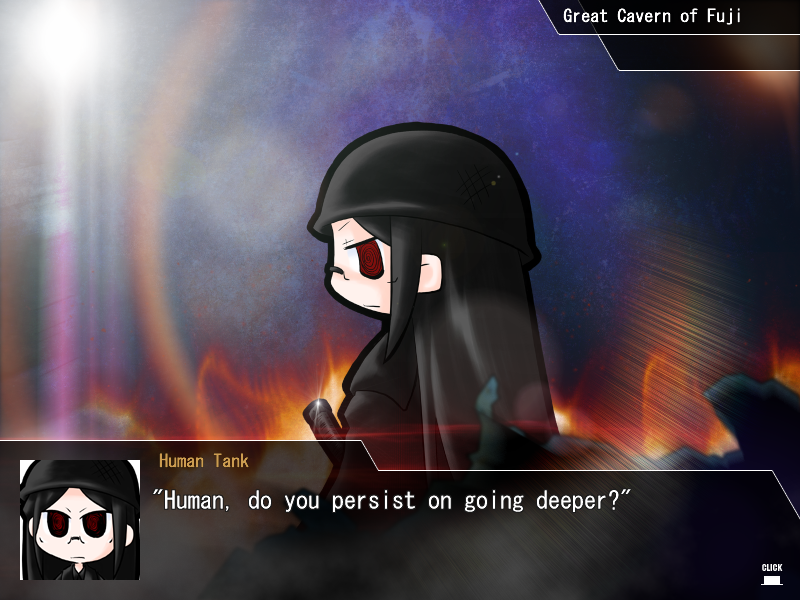 War of the Human Tanks was localized by Fruitbat Factory and released worldwide September 2012. The Human Tanks, Charge! series is developed by Yakiniku Banzai!. “We’ve had players asking for the sequels ever since we originally released War of the Human Tanks – our first game. We are really happy to finally be able to give a favorable response – yes, we will be bringing over the entire Human Tanks series! Many will also be interested to hear that the games will be available on Steam upon release.” says Jakke Elonen, project lead. is a bullet hell type shoot’em’up starring the pudding-loving dog girl QP, whom you might remember from 100% Orange Juice. Nothing can stand between QP and her pudding – not even difficulty options to reduce the experienced gamer to tears! QP Shooting – Dangerous!! is developed by Orange_Juice. 100% Orange Juice was developed by Orange_Juice and published by Fruitbat Factory in September 2013.
stars fan-favorites Saki and Komiya, and adds brand new characters. A story of tragic love and foxes’ games told in visual novel style, the Cage of Night takes place during the events of 99 Spirits storyline and is set in a darker mood than the main story. is another new addition to the 99 Spirits storyline. Within it unfolds a new adventure for Kotetsu and Waka, where a duty Kotetsu undertakes turns out to have unforeseen and dangerous consequences. The two side stories are planned to be released as DLCs to 99 Spirits. 99 Spirits was originally developed by TORaIKI and published worldwide by Fruitbat Factory in May 2013. “We are releasing our third Steam game, 100% Orange Juice, in just a few days, and after that we’ll be putting on the finishing touches for Cage of Night’s release as a 99 Spirits DLC. We are also excited to bring over more of the adorable dog girl QP in the hellish shooter QP Shooting – Dangerous!!. Her quest for pudding seems to never end.” adds Ozhan Sen, graphics and marketing lead. War of the Human Tanks and 99 Spirits are available on Steam for PC (Windows). The Steam version of 100% Orange Juice is hitting the shelves on May 16 with all-new online multiplayer, HD resolutions support, Steam achievements, stats and trading cards. To add some music to the celebrations, Sound of the Human Tanks, music collection for the Human Tanks series, and 99 Spirits – Artbook & Soundtrack Pack can be found -50% off on Steam for the duration of this week.